Each section is a direct continuation of the previous section, and only separated for clarity. Although the page looks complex, it is not. It is possible to perform the steps on this page in less than one minute once familiar with the process. If you have come directly to this page without following the guide and are unsure of how to set up your Sources on your computer/NAS, skip back to Naming Video Files at the start of the guide. Check the settings of the scraper are configured to your preference. The default settings are usually good enough, but you may have different preferences or needs. When checking settings, ensure you access the scraper settings from the Context Menu of the TV Show Source. Accessing it through the add-ons menu only adjusts the default settings, and won't adjust settings on the currently active sources. TVDB was the default Kodi scraper until 19 November 2018 when the scraper changed to the current TheMovieDB-TV Shows scraper . Due to a lack of communication from the TVDB, the high level of complaints on their forum, and the sudden changes to their API, it was deemed necessary to change provider to ensure a more stable user experience. Enable the setting Show empty TV shows in Settings > Media > Videos. This will make it easier to find tv shows in your library that failed the scraping process. Step 1: Select VIDEOS in the home screen menu. Step 4: Select the BROWSE button from the ADD VIDEO SOURCE window. Step 6: Either use the default name or rename the Source. The name doesn't matter to Kodi, but keep the names unique for ease of maintenance. Then select OK. Step 7: The set content window will display. This is where the media type is set. Select the option This directory contains. Step 8: Select the type of media that is in the Source. 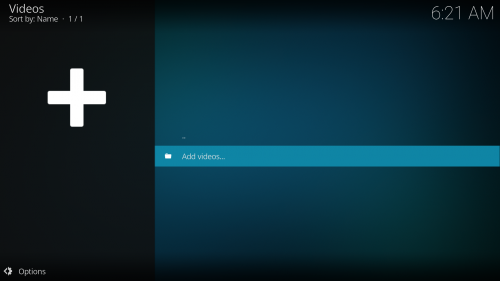 The left image is the Set Content screen for Movies. The right image is the Set Content screen for TV Shows. Continue these steps using the appropriate one, not both. Step 9a: The Movie Database for movies is the default scraper and is automatically selected. Step 9b: The Movie Database for TV Shows is the default scraper and is automatically selected. Kodi will load artwork files using the short format <artworktype>.jpg/png filenames, but will fallback to the longer <NameOfVideoFile>-<artworktype>.jpg/png format as required. NFO files must be named the long format <MovieFileName>.nfo filename. Artwork files must be named using the long format <NameOfVideoFile>-<artworktype>.jpg/png filenames. Normally greyed out unless you have selected a single movie folder within an existing source. Disabled when a Source is selected. Becomes Enabled when a Movie folder is selected. Prevents the Source from being scanned when an Update Library is running. When Enabled it will speed up the Update Library process in large libraries if the Source no longer has content added to it. Allows you to change the Content settings for a particular TV Show without affecting the entire Source. Disabled when a Source is selected. Becomes Enabled when a TV Show folder is selected. Alternate scrapers are available, and can be installed using the Get More button from the Choose information provider option shown in Step 9. Only change the default scraper if you have a particular reason to. Use the original (untranslated) title when downloading info for a foreign film. For example the movie Crouching Tiger, Hidden Dragon (2000) is the English translated title of the movie. The Original Name of the movie is 卧虎藏龙. If you prefer the English translated title, then disable the setting. If you prefer the original Chinese title then enable the setting. Enable this setting to download Fanart. Downloads the link to a movie trailer at YouTube. If you have local trailers, ensure this setting is disabled. Choose site to download movie ratings from. Choices are TMDB and IMDB. If IMDB is selected, it becomes the default rating. TheMovieDB rating is still scraped. Only visible if the previous setting is set to TMDB. Allows scraping of ratings from both sources, but keeps TheMovieDB rating as the default rating. For example the movie Crouching Tiger, Hidden Dragon (2000) is the English translated title of the movie. The Original Name of the movie is 卧虎藏龙. If you want the English translated title, then disable the setting. If you want the original Chinese title then enable the setting. (if No is pressed, it can be scanned later via the Source Context Menu). 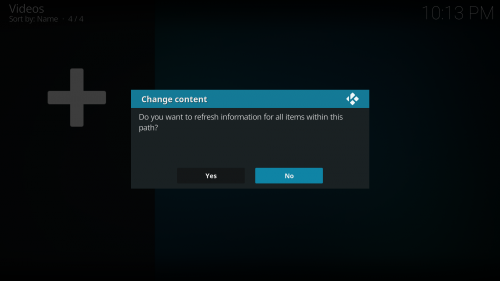 Once you press Yes, Kodi will scan your library and attempt to match each title in your library to the title at the site of the Information Provider. If a match is found, the metadata and artwork is downloaded and used for the library display. Depending upon the size of your library, this could take some time. A single movie could take approx 30 seconds, a library of 400 movies could take over an hour. At this point, you should now have a fully functioning video library. Repeat the steps on this page to add the remainder of your media. The remainder of this page deals with Special Use cases and can be safely ignored. Select a remote location, and you should be able to browse to the remote server. Image 1- Select Add network location... from the Browse for new shares' list. Image 2- In the new window select the correct Protocol for your Network Share, then select Server Name. 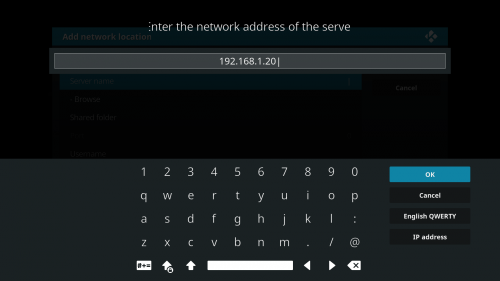 Image 3- Type in either the IP Address or the Device name of your server. Note: if you use a dynamic IP for your NAS you could lose access to your shares if the IP changes. It is recommended that you use a static IP if adding your share this way. 4.1 In the Shared folder section, type in the name of the folder you wish to add. You will be required to add the drive letter eg f/Movies. 4.2 If your share requires a Username and Password enter them in the appropriate sections. 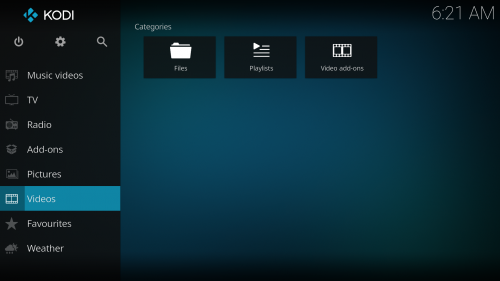 You might notice that Kodi has an "ADD" button in addition to a "BROWSE" button when you are adding a source. After you add your first location, you can add a second location (network or local. 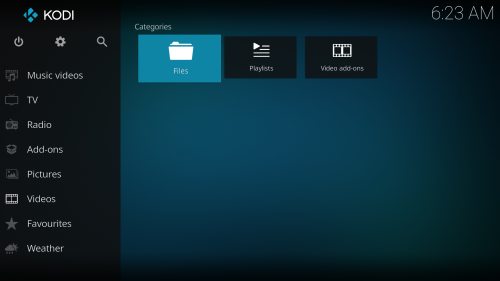 you can even mix them) and Kodi will show both folders as a single folder/source. You could have half of a show on one hard drive, half on another, and Kodi will show it to you as if it was in a single location by using multiple locations in a single source. Note: This only impacts the basic "Files view". The default Library nodes will combine things by show even if their files are spread across multiple drives. Most users will not really benefit from using multiple paths in a single source. This page was last edited on 18 April 2019, at 03:24.